Dr. Kristie A. Ford is Professor of Sociology, Director of the Center for Leadership, Teaching, and Learning, and Founder of Skidmore College's Intergroup Relations (IGR) Program. She received her B.A. in sociology from Amherst College and her M.A. and Ph.D. in sociology from the University of Michigan, Ann Arbor. Her research and teaching interests include: race and ethnicity, gender and sexuality, and social justice education. Dr. Ford explores the connections between race and intersecting social identities in relation to two broad fields of study: (1) body management practices, and (2) pedagogical approaches to teaching and learning. In three such projects she examines these issues in relation to: (1) appearance ideals in the Black community, (2) women of color faculty experiences in academia, and (3) inter-/intra-group interactions in peer-facilitated service-learning and social justice courses. 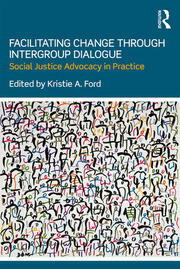 Dr. Ford’s courses, including Race & Power, Racial Identities: Theory & Praxis, and the Black Female Body, reflect these scholarly interests, as do her service commitments, which include the development of the Black Faculty and Staff Group (BFSG) at Skidmore in 2008 and the creation of the first Intergroup Relations (IGR) minor in the United States in 2012. Based on her expertise in the field, Dr. Ford also consults widely with colleges/universities across the United States; in the last six years, she has facilitated approximately forty workshops on teaching and learning as well as diversity, inclusivity, and social justice. For her work, she has received several honors, including: the President's Award at Skidmore College, the NAACP Community Service Award, and the Regional Leadership Council on Inclusion Award. Ford, Kristie and Josephine Orlandella. 2015. "The 'Not So Final Remark': The Journey to Becoming White Allies." Sociology of Race and Ethnicity 1(2): 287-301. Ford, Kristie. 2015. "Exploiting the Body and Denouncing the Mind: Navigating a Black Female Professional Identity within the Academy." In Racial Battle Fatigue in Higher Education: Exposing the Myth of Post-Racial America, edited by Kenneth Fasching-Varner, Katrice A. Albert, Roland W. Mitchell, and Chaunda Allen. Lanham, MD: Roman and Littlefield. Successful Peer Classroom Dynamics.” In Faculty Identities and the Challenge of Diversity: Reflections on Teaching in Higher Education, edited by Mark Chesler and Alford Young, Jr. Herndon, VA: Paradigm Publishers. Intra-Racial Curricular Dialogues on the Experiences of White College Students.” Journal of Diversity in Higher Education 5(3): 138-158. Ford, Kristie and Victoria Malaney. 2012. “‘I Now Harbor More Pride in My Race’: The Educational Benefits of Inter- and Intraracial Dialogues on the Experiences of Students of Color and Multiracial Students.” Journal of Equity and Excellence in Education 45(1): 14-35. Ford, Kristie. 2012. “Thugs, Nice Guys, and Players: Black College Women’s Partner Preferences and Relationship Expectations.” Black Women, Gender, and Families 6(1): 23-42. Experiences with White Students in the College Classroom.” The Journal of Higher Education 82(4): 444-478.
of Self Among Black College Men.” Symbolic Interaction 34(1): 38-62. Race and Ethnicity; Black Identity in the U.S. and the African Diaspora; Gender and Sexuality; Body and Embodiment; Social Identities and their Intersections; Social Inequality, Social Justice, and Social Change; Inter-/Intra-group Dialogue; Engaged Pedagogies/Applied Sociology; Qualitative Methodology; Social Research Methods.